Pumpkins are a great choice for a kids' garden. One tiny little bean planted and tended to in the summer turns into a huge orange pumpkin just in time to carve a Halloween jack-o'-lantern or bake a Thanksgiving pie. Working with pumpkin seeds is a little more advanced than working with other seed types. Have the child place the pumpkin seeds in a bowl and cover them with water. Allow the seeds to soak overnight. This process softens the shells and encourages quick germination once they're planted. Find a sunny spot that is large enough for the number of pumpkins you wish to plant. Explain to the child that the seeds will grow into large plants that produce a lot of runners as well as fruit. The spot where you plant your pumpkin seeds should receive at least six hours a sunlight a day and more is preferable. Use the shovel to build a round mound, approximately 12 inches in diameter, for every couple of pumpkin plants. Dig a hole about 18 inches into the ground and then mix the manure in with the soil in your planting area to form the mounds. Each mound should be about 6 inches high. The mounds should be spaced approximately 1 to 2 feet apart from each other. Ask the child to plant the pumpkin seeds in each mound. The seeds should be pressed directly into the soil until they are about 1 1/2 inches deep. Several seeds can be planted in each mound but they should be placed 5 to 6 inches apart. Make certain the seed is resting on its flat side and is covered with soil. Lightly water the seeds using a can or a hose and sprinkler. It's important that the ground where the seeds have been planted is moistened gently. Too much water pressure will knock the soil off the seeds or displace them all together. Water the plants daily until the seeds begin to sprout. 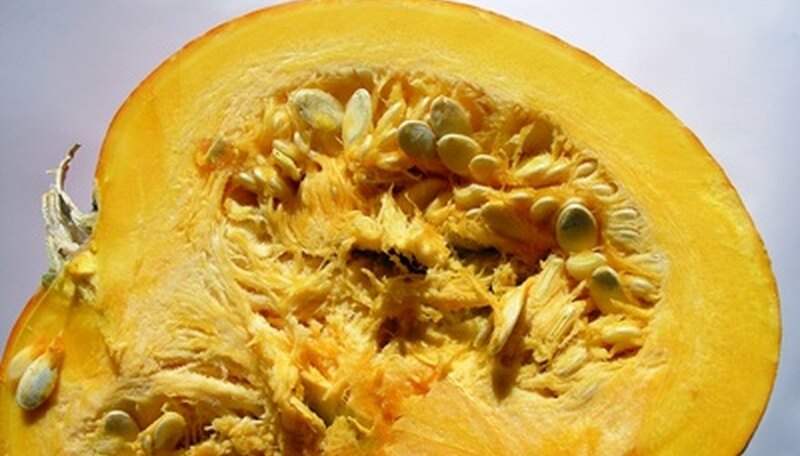 Plant the seeds in May if you are looking to harvest pumpkins in October. The seeds should begin to push through the soil in seven to 15 days. Check on the plants daily and water them often. As they begin to grow, prune larger leaves that develop as these could block the sun and cause the fruit to ripen unevenly. Pumpkins are ready to be harvested when their stems start to crack. Baby pumpkin plants are attractive to slugs and snails - protect them when they are very young by covering them at night with a mason jar.